Preparation Cut broccoli rabe into 3-inch-long pieces. Cook in a large pot of boiling salted water (3 tablespoons salt for 6 quarts water), uncovered, until tender, about 5 minutes. Drain, then rinse under cold water to stop cooking. 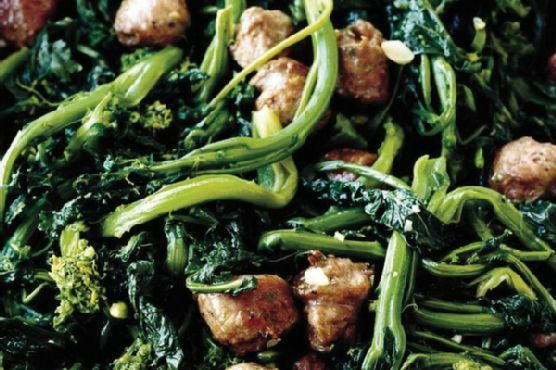 Squeeze out excess water from handfuls of broccoli rabe. Meanwhile, preheat broiler. Broil sausage in a 4-sided sheet pan 3 to 4 inches from heat, turning occasionally, until cooked through, about 5 minutes. Keep warm, covered. While sausage broils, heat oil in a 12-inch heavy skillet over medium-high heat until it shimmers, then cook garlic, stirring, until fragrant but not browned, about 1 minute. Separate broccoli rabe, then saut in garlic oil until coated with oil and heated through, about 4 minutes. Stir in sausage. Cook' note:Broccoli rabe can be cooked 1 day ahead and chilled.